Interop 2011 HP is polishing up some new switches and gussying up some others, following up on a broad set of announcements that it made back in May. The company is also trotting out some services to help customers make the transition from IPv4 to IPv6. With all the Sturm und Drang going on at HP these days, a calm and reasonable product announcement is relaxing. There may be a lot of things up in the air at the company, but its networking business is not one of them. The integration of 3Com is complete, and a converged 3Com-ProCurve product line is bringing HP extra revenue while providing a better convergence story to tell along with products that span data centers and campuses, and reach out into service providers. The new HP 5900AF and HP 5920AF top-of-rack switches that the company debuted this week at the Interop conference and expo in New York are based on merchant silicon (which HP did not want to divulge) that deliver sub-microsecond latency on their 10 Gigabit Ethernet ports. The 5920AF is a 24 port top-of-racker that fits in a 1U chassis. It handles Layer 2 and 3 traffic and, of course, supports both IPv4 and IPv6 Internet protocols. The switch ASIC inside the 5920AF has 480Gb/sec of switching capacity and a packet forwarding rate of 357 million packets per second. The 5920AF is also equipped with a 9MB packet buffer and a supplemental 3.6GB deep packet buffer. The switch does not support the Fibre Channel over Ethernet (FCoE) converged server-storage protocol, but it does support HP's Intelligent Resilient Framework (IRF) switch stacking and management clustering, which allows for up to four of the 5920AF switches to be managed as a single switch with a single IP address. The 5920AF also supports Data Center Bridging (DCB), which virtualizes data center network connections to allow for different quality of service levels on traffic across multiple switches. This is necessary because storage devices running FCoE are not as forgiving of traffic burps and dropped bits as servers and PCs sitting on Ethernet networks. "Best effort" is not good enough for data passing over the network to and from storage. 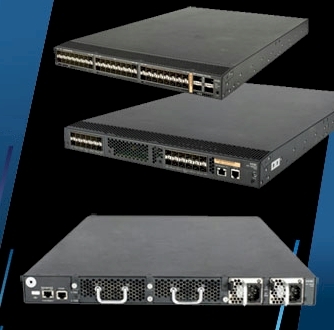 The 5900AF does not have zero ports, as its name might suggest, but has 48 10GE ports plus four 40GE uplink ports for hooking to faster core switches. Its ASIC is also cranked all the way up to 1.28 Tb/sec of switching capacity (boy that sure sounds like the Trident+ ASIC from Broadcom, also used by Dell in its Force10 switches) and has a packet-forwarding rate of 952 million packets per second. It does not have the 3.6GB deep-packet buffer cache, and it will support FCoE with a future software patch. DCB and four-way IRF are supported, just like on the 5920AF. The HP 5900 series of switches will be available in the first quarter of 2012, with a base machine starting at $38,000 for the 24-porter. Prices were not divulged for the 48-porter. In addition to previewing the new 5900 top-of-rackers, HP has also updated its 12500 (formerly A12500) top-end modular switches, adding support for the IRF management consolidation software to this monster switch, which has 128 10GE ports and 6.66Tb/sec of switching capacity. You can do 512 ports if you do 4-to-1 over-subscription, and the chassis will support 40GE and 100GE speeds when they become available. With IRF, four 12500 switches can be managed as one with a single IP address. Incidentally, the 12500s are based on IBM's PowerPC processors. 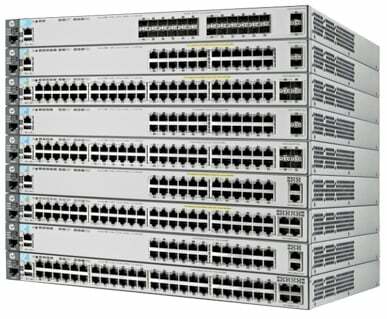 HP has also launched the 3800 campus switch, a fixed-port managed Ethernet switch aimed for departmental use that supports 24 or 48 ports running at Gigabit Ethernet speeds, and which in some models has Power over Ethernet (PoE) to juice up devices on the end of the Ethernet cables. There are three models of the 3800. One has 24 PoE ports and two 10GE uplinks that have 88 Gb/sec of switching bandwidth, and can handle 65.4 million packets per second. Latency is around 2.8 microseconds for the Gigabit ports and 1.9 microseconds for the 10GE ports. A variant of this 24-porter is available without the PoE feature. And finally, there is a 48-port version with four 10GE uplinks and the same port latencies, which has twice the message bandwidth and switching capacity. The base 24-port version of the 3800 without PoE costs $4,969. In addition, HP has created two new services modules for its 5400zl and 8200zl modular data center switches (formerly known by the E designation), one aimed at running VMware's ESXi hypervisor and the other for running Citrix Systems' XenServer hypervisor. These zl modules are based on x86 processors and have their own memory and two 10GE network interfaces to hook into the backplane of the switch. The idea is to enable HP as well as its partners to load applications and run them on the switch instead of an outboard server. Up to four of these modules can be plugged into the modular switches. The ESXi module costs $5,299, and the XenServer one costs $4,499. HP is also previewing its Intelligent Management Center 5.1 network management tool, which will be available in the first quarter concurrently with the new 5900 top-of-rackers for $6,995. HP boasts that its network management tool doesn't just work with its own switching iron, but has been certified to manage 5,786 devices from over 150 different manufacturers. And finally, HP is cashing in on the need to transition networks from the IPv4 protocol to IPv6, launching consulting services to help customers figure out if their networking equipment supports IPv6 or not. "Chances are, companies already have products that are IPv6 ready and they just don't know it," Yanick Pouffary, an HP distinguished technologist and the global lead for IPv6, tells El Reg.